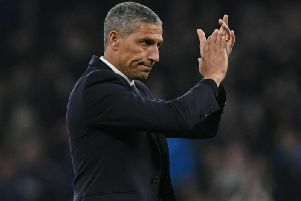 Brighton manager Chris Hughton anticipates a quiet end to the transfer window - in and out of the club. Albion have signed forward Jurgen Locadia for a club record £14m fee from PSV Eindhoven this January and brought in Leonardo Ulloa from Leicester on loan for the rest of the season earlier today. Asked about bringing in any more new faces, Hughton said: "I must admit, I don't see too much more happening. "We have a squad in place and you of course never know. There certainly will be business at clubs over these next two days and even going into that last day. "At the moment, I'm not really anticipating anything else happening but you never know." As for any players leaving the club. Hughton said: "No. What we have done and have made it fairly clear to most potential enquiries is that we are about building a squad. "We have a period of the season left now and we are in a position with a big group of teams. We need to make sure we give ourselves the best possible chance and that means keeping all of the players we want to keep."